60 Choux pastry profiteroles filled with stabilised cream, with a pot of caramel sauce, a pot of Belgian chocolate sauce and a pot of edible decorations. Get creative with building and decorating this Croquembouche that is fun for all of the family. 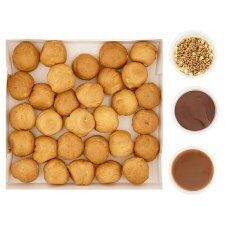 The kit includes a Croquembouche stand and base, 60 choux pastry profiteroles filled with British cream, caramel sauce, indulgent Belgian chocolate sauce, glittery stars and popping candy to decorate. This showstopper can be assembled within 20 minutes and prepared in advance or together with your guests for some added fun. Keep refrigerated. Once assembled, consume within 24 hours and by 'use by' date, shown. (800W/900W). Stand for 1 minute after heating. Remove lid from sauce pot and place loosely back on top. popping candy with white chocolate stars coated in gold dust to decorate. shape. Slide the largest ring down the cone and clip in to the adjacent slots. Repeat with the remaining rings in size order with the smallest last. secure the four tabs at the base of the cone to the white side of the board. Heat the pot of caramel sauce following the reheat instructions. the rings, making sure the profiteroles fit snugly together. croquembouche. Sprinkle the decoration over to finish.